Just a quick graph that shows daily page views to Yahoo! News. 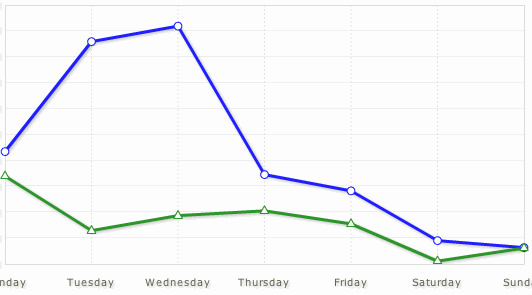 The green line shows the week before the US elections, while the week of the elections is in blue. This comes from our internal numbers; for “competitive reasons” I removed the legend indicating volume — but you can see the site was much busier than the previous week. Uniques, PVs, and PVs per unique all were way up. TechCrunch showed some data from Hitwise on market share of visits for Nov 4. It’s a little strange that Yahoo! wasn’t listed in the TechCrunch graph, even though Yahoo! placed first overall. 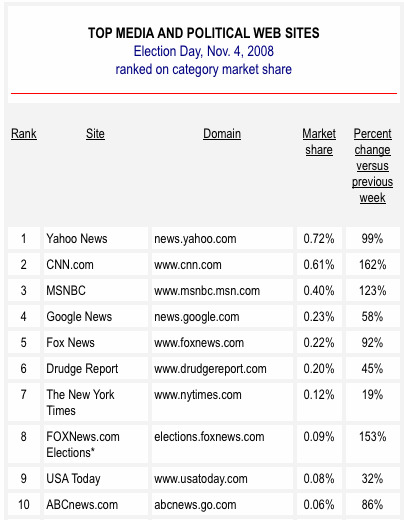 Also interesting that the Drudge Report was so high. Here are the top 10 .. for more, see Media Life Magazine .